Some great widescreen laptops have come from Acer's Aspire range over the years, and the Aspire 8935G-744G50Bn continues this trend – providing an outstanding screen, great features and good all-round capabilities. The large 18.4-inch screen is stunning, and one of the best we've seen to date. The glossy coating stretches right to the very edges of the panel and, although it's reflective, it produces a vast array of colours, proving perfect for movies and photography work. It matches the equally impressive 1920 x 1050-pixel resolution of the Sony VAIO VGN-FW51ZF/H, with pin-sharp images on offer. There's also an integrated Blu-ray drive to let you take full advantage of the gorgeous high-definition (HD) display. This machine has been fully designed for multimedia use, with lots of design touches to improve accessibility. There's a control bar to the right of the chassis with a host of touch-sensitive buttons, letting you easily skip scenes or songs, and a large wheel for easy volume control. The keyboard features the same floating style as Acer's Timeline products, with the flat keys raised high above the board itself. It won't suit all users, as the lack of definition means you'll need an accurate typing style, but quality is excellent and it is very comfortable. Befitting its status as a high-end machine, the keys are also backlit, which is perfect for working in poor lighting conditions. Every bit of this machine impresses when it comes to quality, with a neat and cohesive design that's backed by sturdy textured plastics. We found the screen to be held firmly in place as you type. 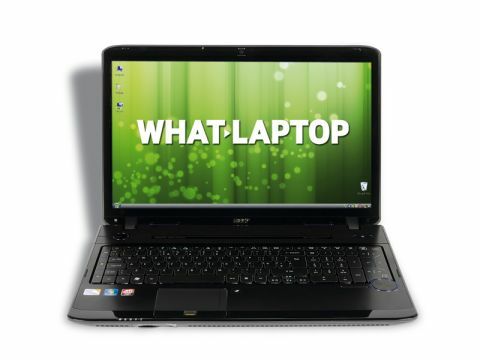 The Acer also features ATi's high-end Mobility Radeon HD 4670 chip. It provides enough performance to play the latest games, and office tasks are dispatched with ease, making this a machine the whole family can enjoy. Everyday performance comes from a mid-range Intel Core 2 Duo processor and 4096MB of memory. While some of the other machines offer faster processors, we found this laptop very able in daily use, with all test software running smoothly and quickly at all times. The high-end specification runs through to the features list, with high-speed network adapters and Bluetooth in place. The Blu-ray drive also doubles as a regular DVD rewriter, and five USB ports let you connect a range of peripherals at the same time. External screens can be connected by either the VGA or HDMI port. We really like the Aspire 8935G. Offering one of the best screens we've seen to date and great usability, it's truly an excellent home media centre.